The talks he gave each night were very different, making it well worth the drive in either direction for those of us who went to both. In Sacramento, the talk was very lighthearted and humorous. It felt more like he just came to hang out with us than to specifically give a talk. He did take questions from the audience for a while, though, so he still ended up touching on a lot of different topics. 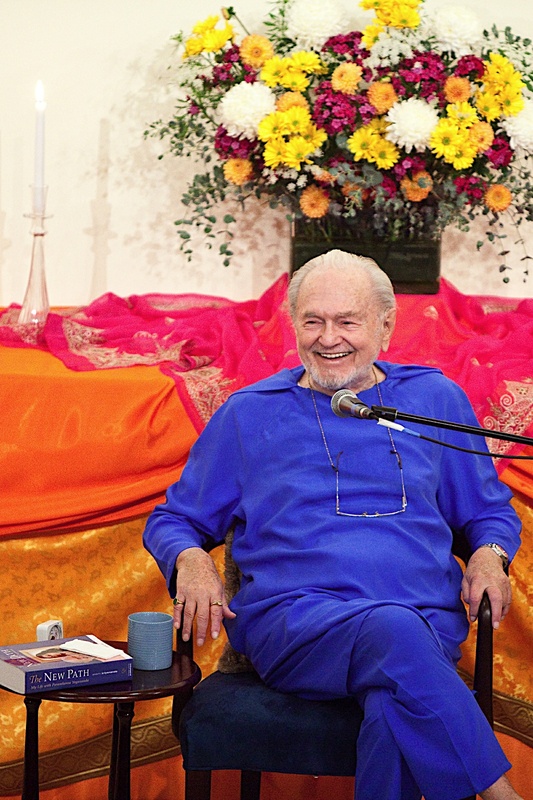 In typically delightful Swamiji fashion, an answer to one question would happily spiral off into long braided skeins of teachings and stories. Sometimes it just doesn't seem to matter which questions actually get asked or not, because you find out that whatever you were wondering about somehow got answered anyway. After one particularly long succession of thoughts, he finally paused and asked "Did I answer somebody's question? I hope so! Who's next?" At the end of the evening, he saved a few minutes for us all to meditate together with him, which was very sweet. In Palo Alto, the talk felt rather more formal, and there was no question and answer segment. He also spent more time on the "buy land in the country because things are going downhill fast" kind of theme, which can leave people feeling a bit less bubbly. But it's a blessing to have that kind of thing told to us by someone who can also show us how to face it joyfully, regardless of how or when it comes. A highlight of the evening was that Swamiji also decided to sing for us. At the beginning of the program he sang "Peace" with the Palo Alto choir, and at the end he sang "God, God, God" a capella. What a perfect song to end on. On each of the evenings, he was wearing a new robe of a brilliant blue, the prototype robe for the new swami order he's working on creating. 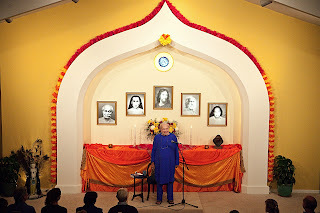 (He says he's "tired of being the only swami in Ananda!") Funny story about that blue, actually: Apparently it was originally supposed to be a very different shade. However, the person dyeing the cloth, who has always been spot-on with color matching in the past, just completely missed by a mile this time around. And yet, once they saw it, everyone realized that it really was the perfect color after all. Fun how things work out, sometimes. 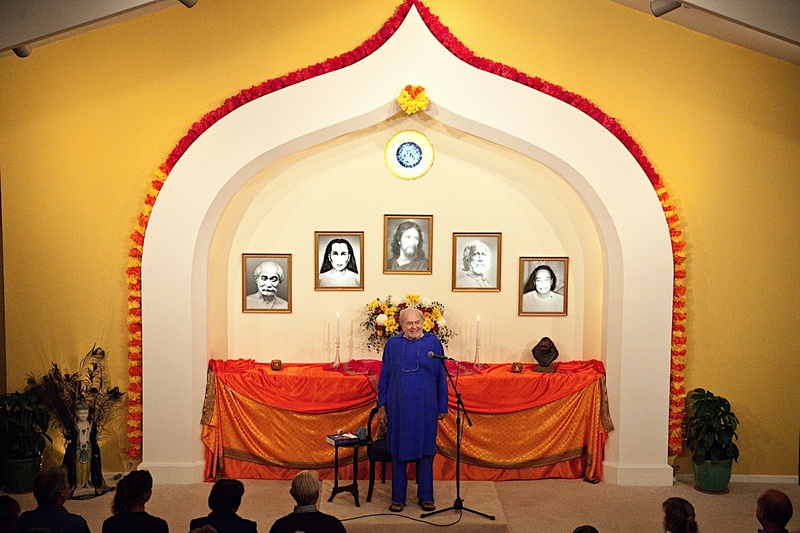 Anyway, Swamiji is now headed back to Italy (and on to India later this year, I believe), but it's been a good few months having him out here and physically closer to us. Looking forward to his visit next year, though!